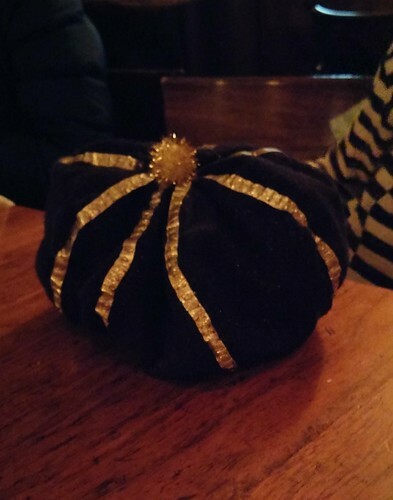 Sis emailed me to ask if I had an appropriate hat, but the closest thing I could find was my pumpkin beret, which is roughly the right shape, but entirely the wrong colors and also adult sized. But I had some black fabric from a previous project lying around. 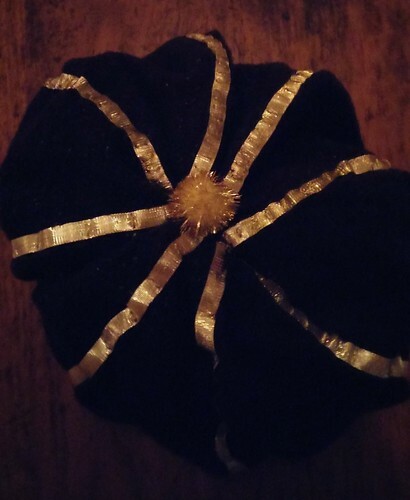 I went to the craft store, picked up a few things, looked up hat sizes online, and got to sewing. I used the pumpkin as a model, but sized everything to roughly 90% of the adult measurements. It came out a little smaller than I'd intended, but it fit. Niece was thrilled. Said it looked "perfect" and "awesome." Also she said she loved the pompom on top, and it looked "so pompomy." This is the girl who, at 9 years old, already makes her own (very stylish and professional-looking) pocketbooks and dresses using her sewing machine, and will happily strut like a model to show them off.